Turkish authorities banned Twitter and Facebook after images spread on social media depicting the suicide car bombing that killed and injured dozens in the Turkish capital of Ankara, local broadcasters reported. Turkey’s telecommunications authority, TIB, blocked access to social media after a court-ordered ban was imposed, Turkish NTV and CNN Turk reported. Access to Facebook, Twitter, and a number of other sites has been blocked because images showing victims of the tragedy were being shared on those platforms, according to the court. Difficulty in accessing the sites has been reported by users. Broadcast media has also allegedly been banned from covering certain aspects of the attack. A journalist from Today’s Zaman, a sister publication of the newspaper Zaman that was recently taken over by the government, said “a ban on networks for coverage of explosion in Ankara” had been issued. 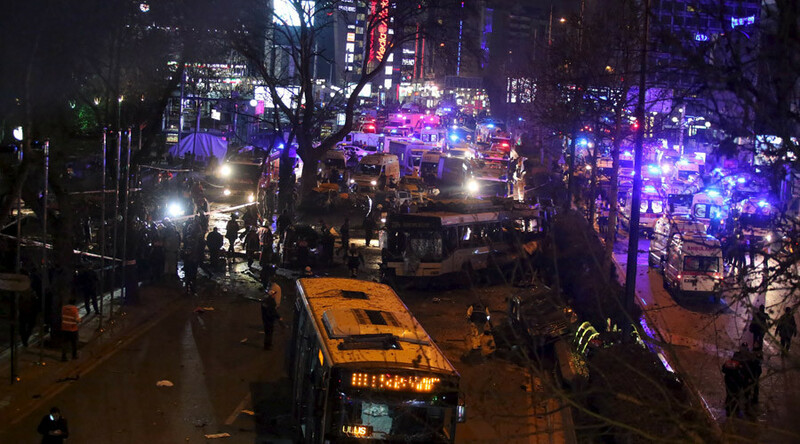 The blast rocked the crowded center of the Turkish capital on Sunday evening, killing at least 34 people and injuring 125. No one has yet claimed responsibility for the attack. Ankara resident Jeremy Salt, a professor at Bilkent University, told RT that there is an atmosphere of fear in the city. “People are very, very frightened” and “just don’t know what happens next,” he said. “The very name of this park, Guven, means ‘safe, secure.’ And it’s the second bombing in about a month. And people were asking the same questions last year, when there was a bombing at the railway station, ‘How could this happen?’ There seems to be something wrong with the security arrangements for the city, for these bombs to be going off in such safe positions. And the [Turkish] government just have to deal with that,” Salt said.